No this was not our rental car, but you get the picture. 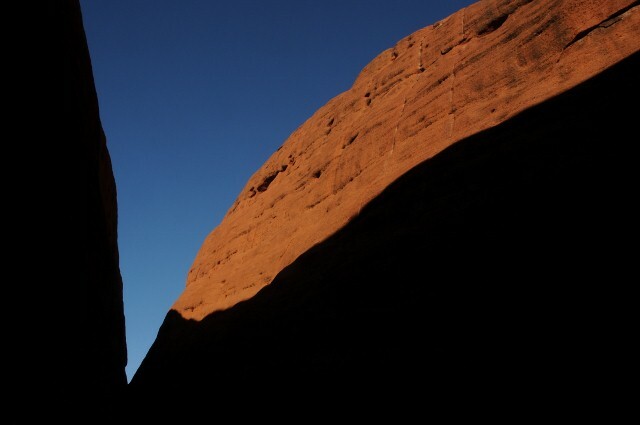 There is a reason they call this place the Red Center. 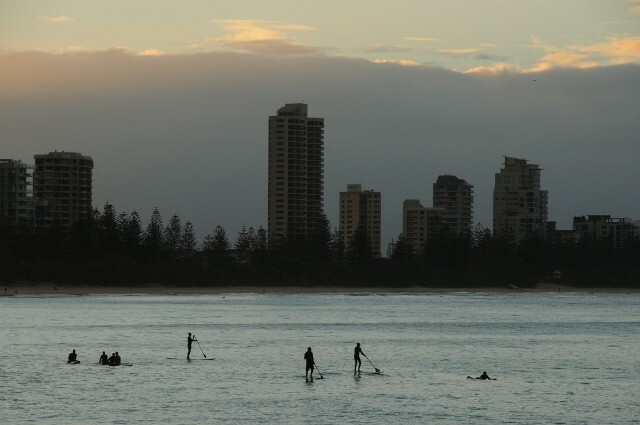 My time in Australia started in a place seemingly far removed from the Outback, a place called Surfer’s Paradise, south of Brisbane, where Gretchen was working at her conference. 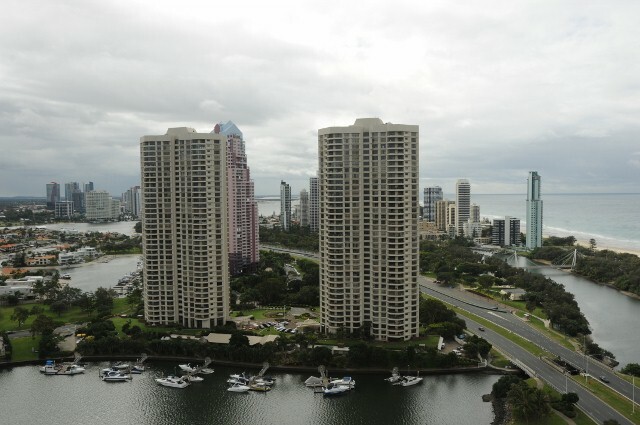 The view from her 24th floor balcony was impressive. This place is kind of an Australian Myrtle Beach. I had to put up with it while Gretchen finished her conference. I know, poor me. But apparently they do surf here. 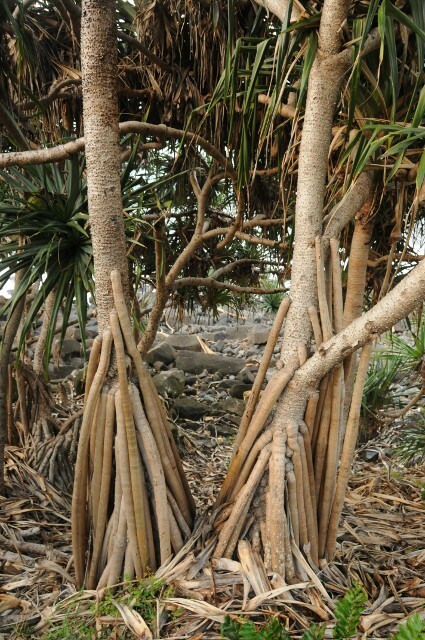 And it is Australia, so the plants do weird things. 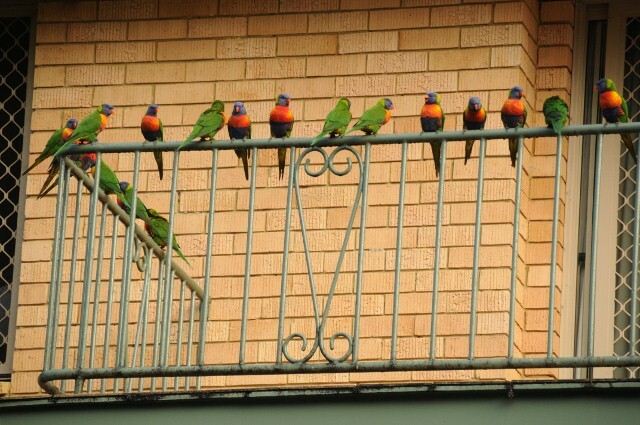 And the birds, well how would you like to wake up with these on your porch? 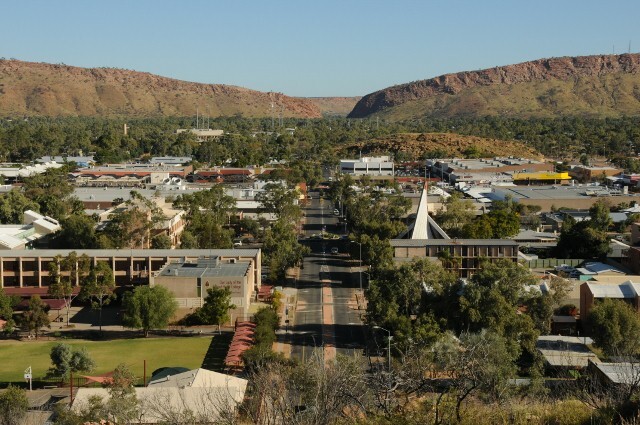 But as soon as Gretchen was done we flew to the heart of the Red Center, the outback “capital” of Alice Springs, in the Northern Territory. A whole 25,000 people live here. It’s hundreds of miles to any place bigger…or to any place at all. 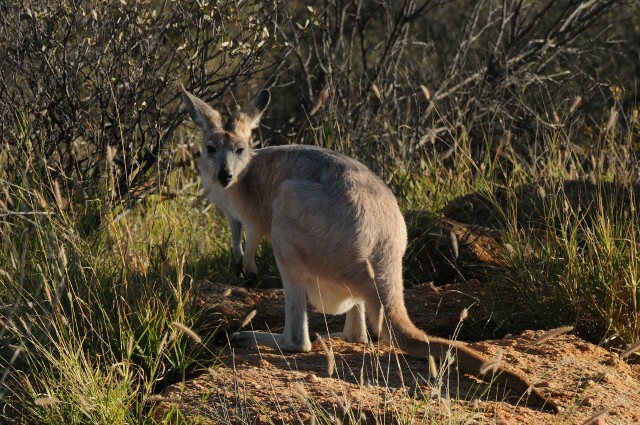 Oh yea, and we saw Kangaroos on our first day there! They really hop! 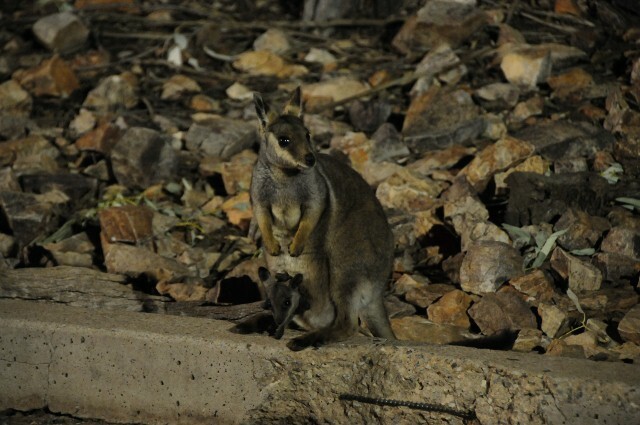 And Kangaroos are not the only marsupials to be seen here, there are also the mostly nocturnal Wallabies, this one with a baby in her pouch. 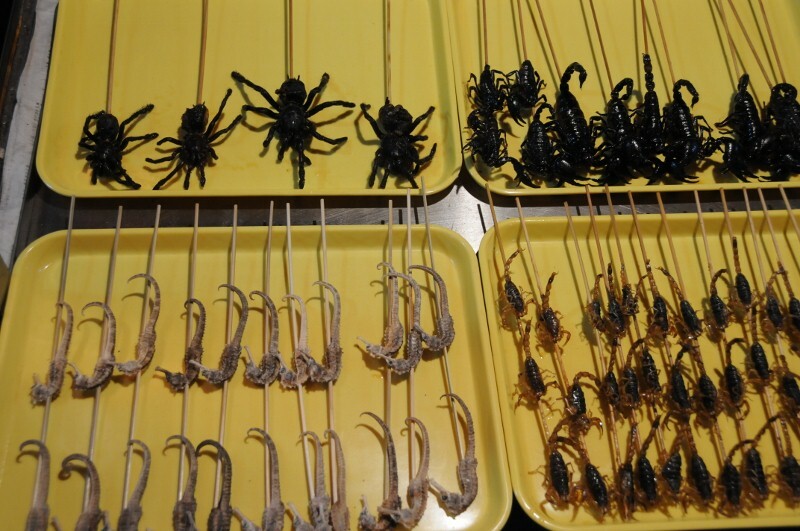 And what do we do right after seeing these adorable critters…we eat them! We had to get an Outback Grill Platter at (the real) Bojangles. Guess who got the spaghetti? 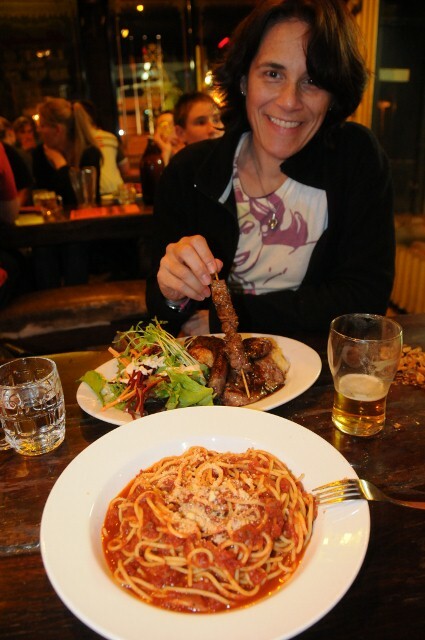 Actually, I think I ate most of the Kangaroo, Emu sausage, Crocodile, Water Buffalo, and Camel on that plate of meat. 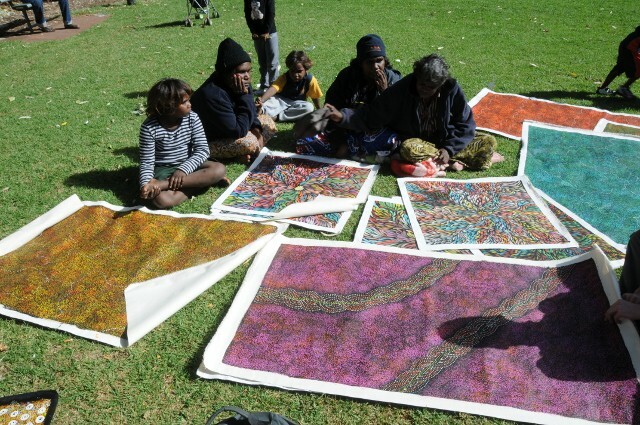 This is an area that still has strong Aboriginal influence (as strong as the decimated Aboriginal population can muster), and they can be found out selling their traditional paintings on the streets. Out here it’s all about the land, and the rocks can do strange things. 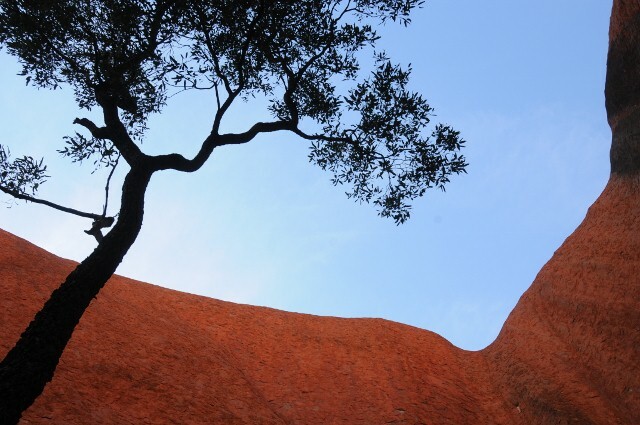 Which must inspire the people, so Gretchen had to make her contribution to the underwear tree on our drive to Uluru. 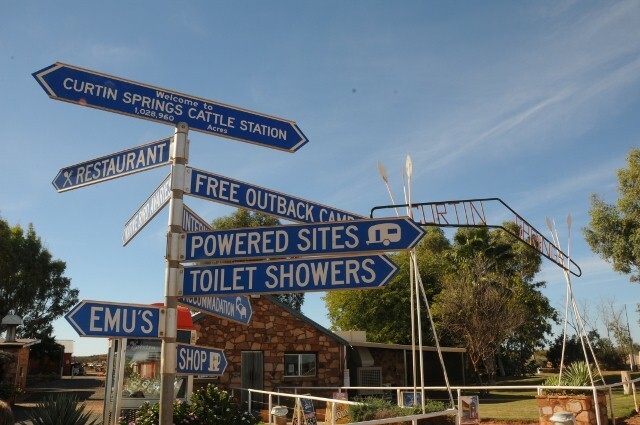 There are only small Roadhouses on the four hour drive from Alice Springs to Uluru. 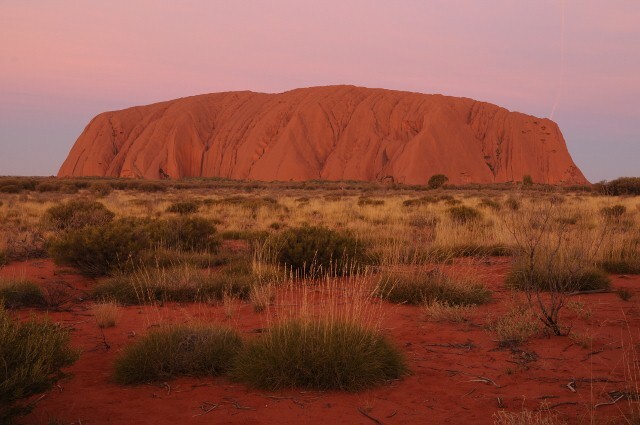 They usually offer basic accommodation, gas and eats, and usually a few penned in Emu…and toilets. 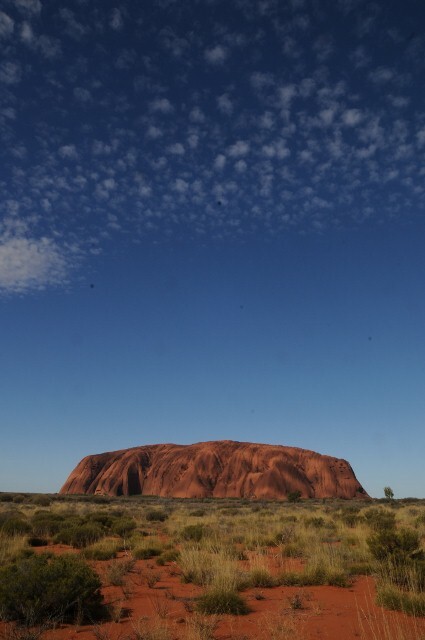 Ok, so the real reason we came all the way out here, is to see rocks, ok one big rock, do some strange things. 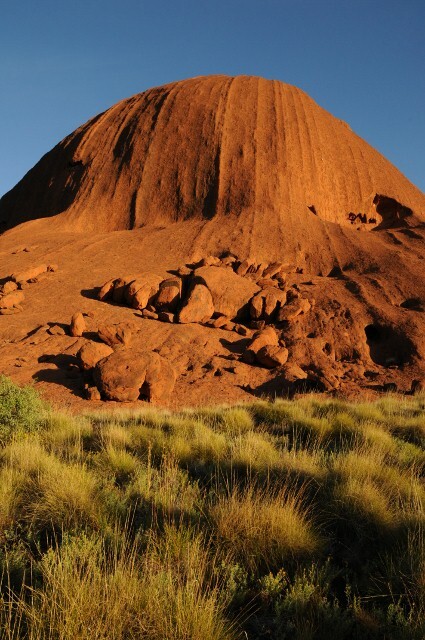 This is Uluru, formally known as Ayers Rock. 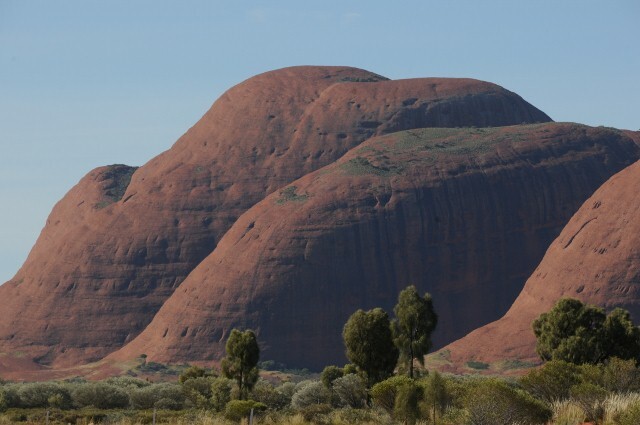 After the land surrounding this place, that is sacred to the Aboriginal people here, was given back to the “Original Owners” the name was changed to Uluru, much the same way we now refer to Mt. McKinley in Alaska as Denali. 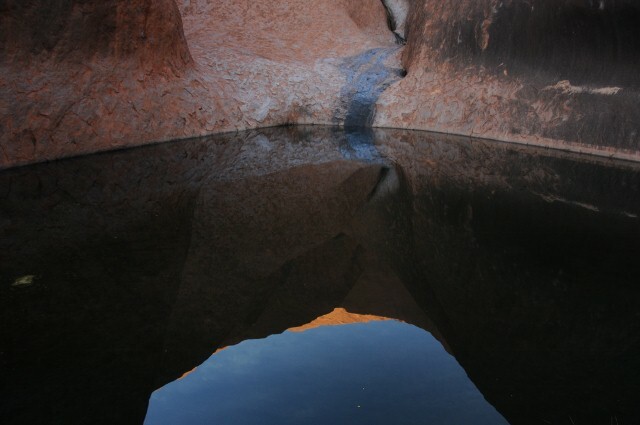 We did the walk all the way around the base of Uluru, at times going right up to the steep sides, and into crevices that sometimes held pools of water. 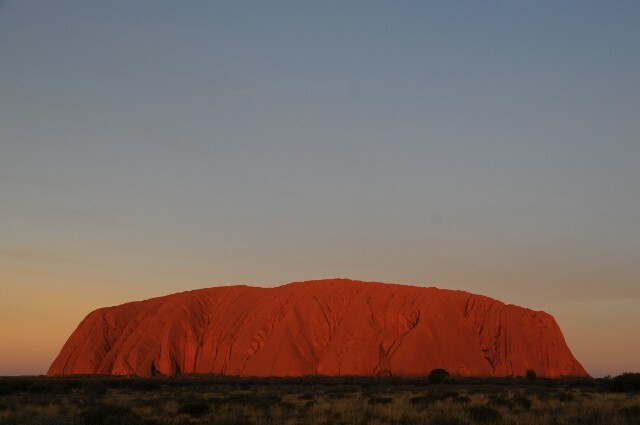 And Uluru is not the only notable rock here. 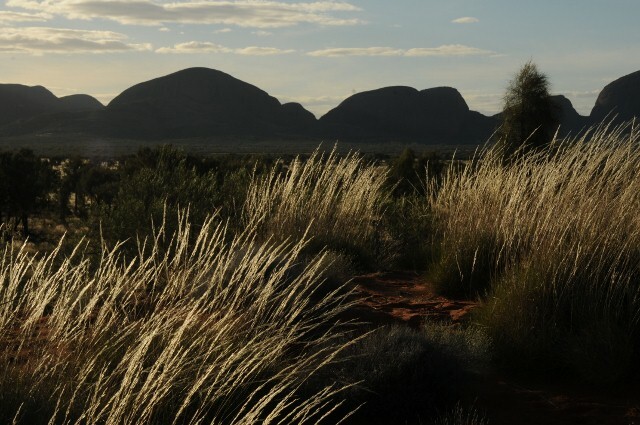 There is also Kata Tjuta (many heads), not as well known, but no less striking. 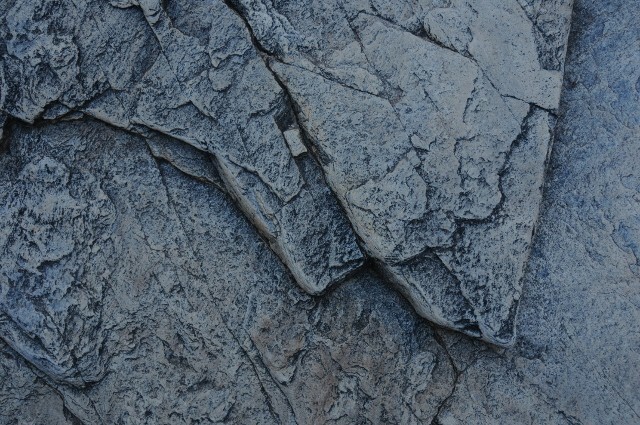 We could hike right between these massive rocks. Of course we had to be the last to leave the park, and be moved along by the ranger. It’s a whole different universe out here. 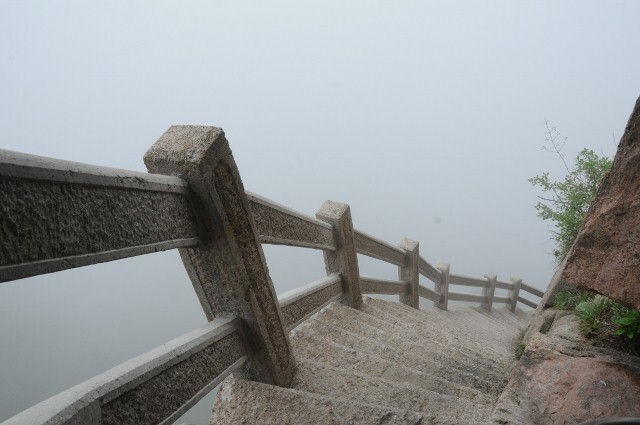 As I ended my time in Shanghai, and then a brief stint back in Beijing, I tried to take it all in (I apparently took too much in, getting sick the last day in Beijing before leaving China). 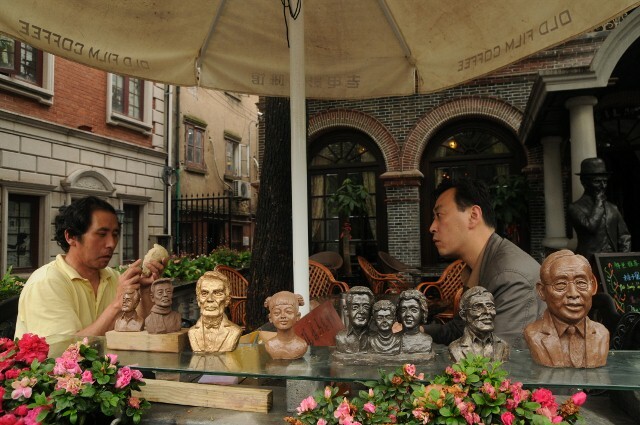 Artists ply their trade on the street in an artsy area of Shanghai. Recognize anybody? 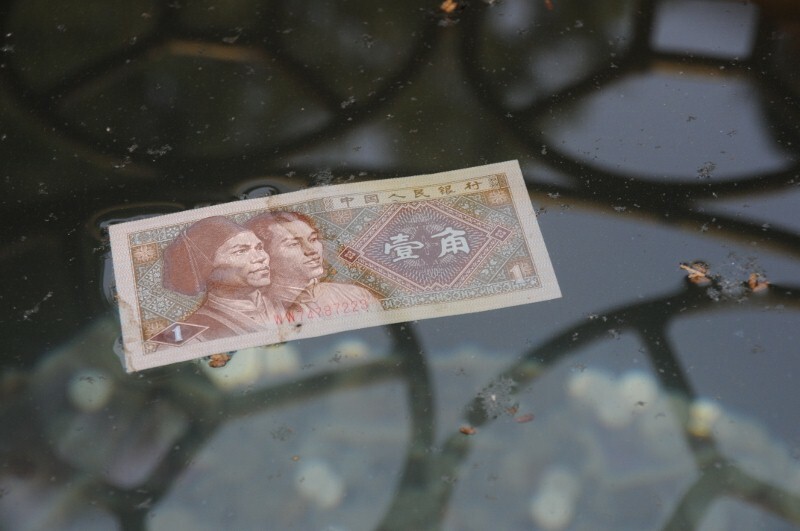 Shanghai is a river city. 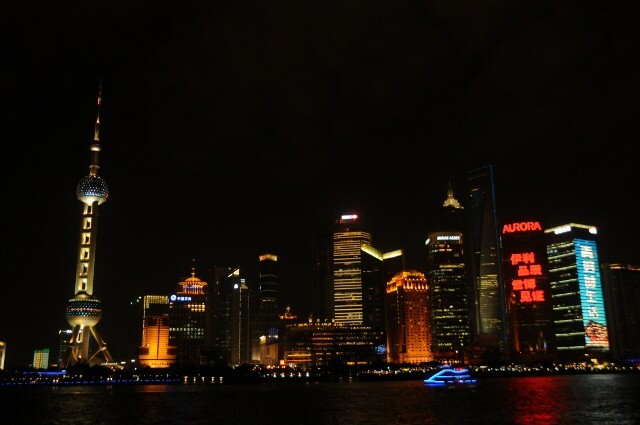 On one side of the Huangpu River is the city that began as a colonial settlement of the British, French, and yes, even the Americans. 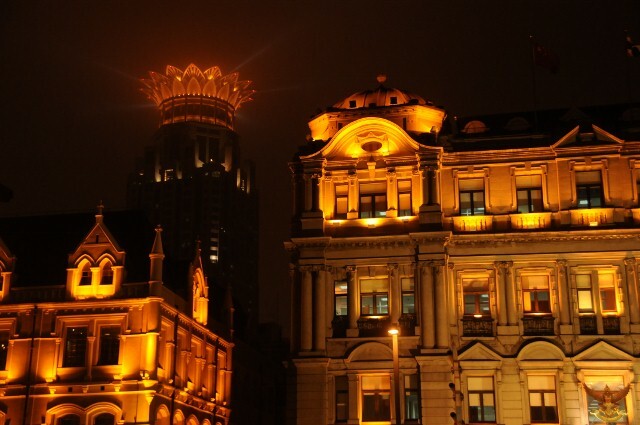 This architectural heritage survives along the Bund, the area along the river. 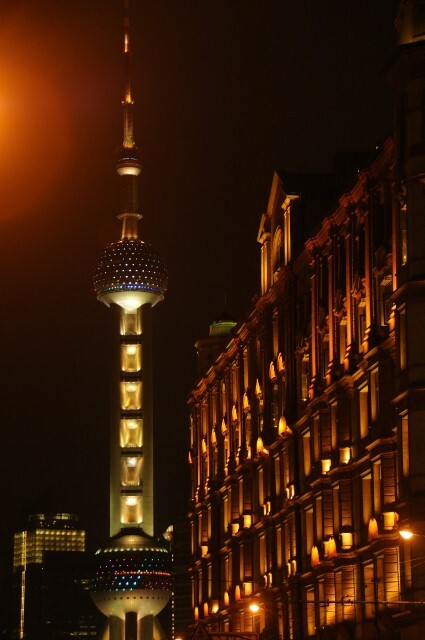 Modern Shanghai looms over the colonial Bund area. 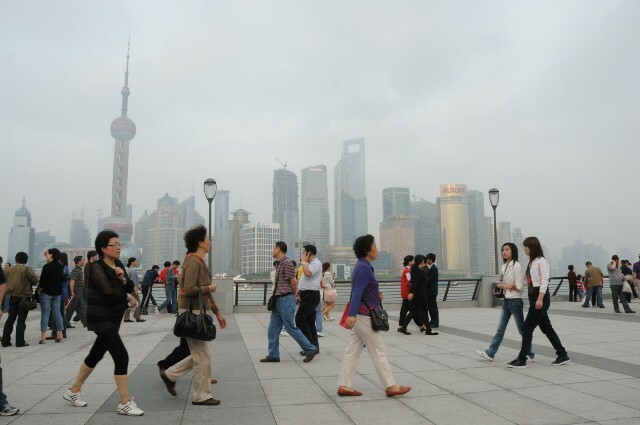 And around this core, the modern city has grown, most strikingly across the river in Pudong. This area was undeveloped just 20 years ago, now it looks like Manhattan (without the charm as of yet). 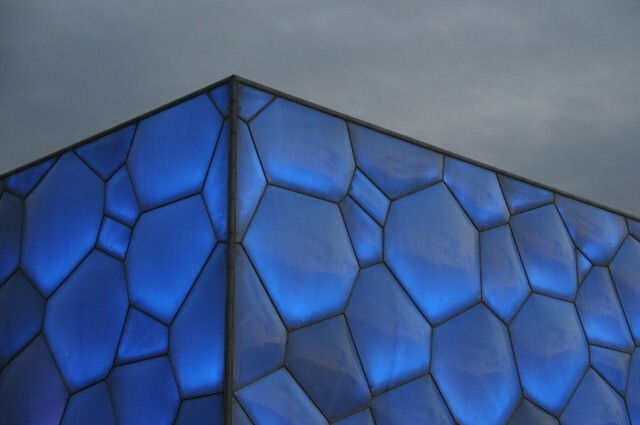 Futuristic buildings at the Expo site in Pudong. 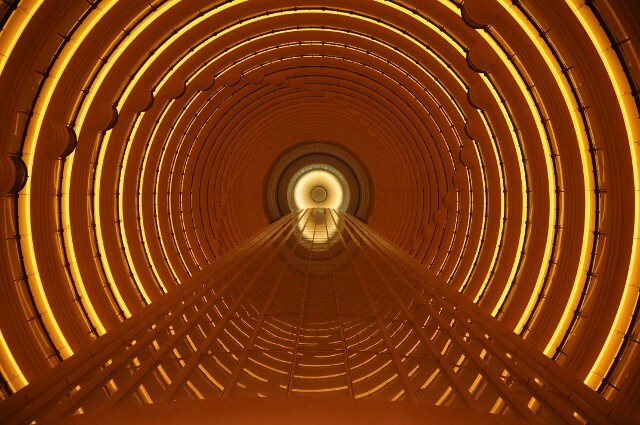 The Grand Hyatt occupies the top floors of the Jinmao Tower in Pudong. 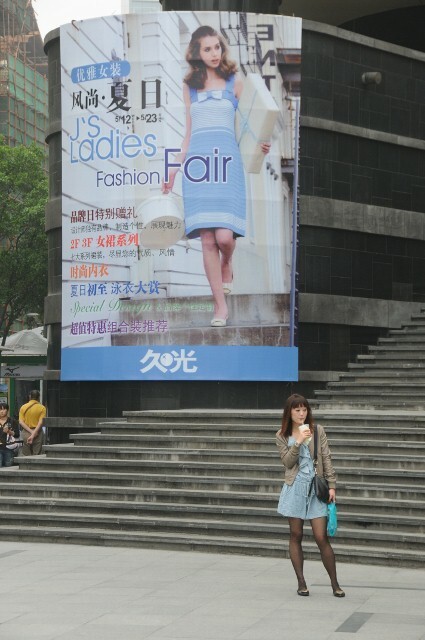 Business is now king in Shanghai (and other parts of China), and the city also sees itself as a new fashion capital as well. 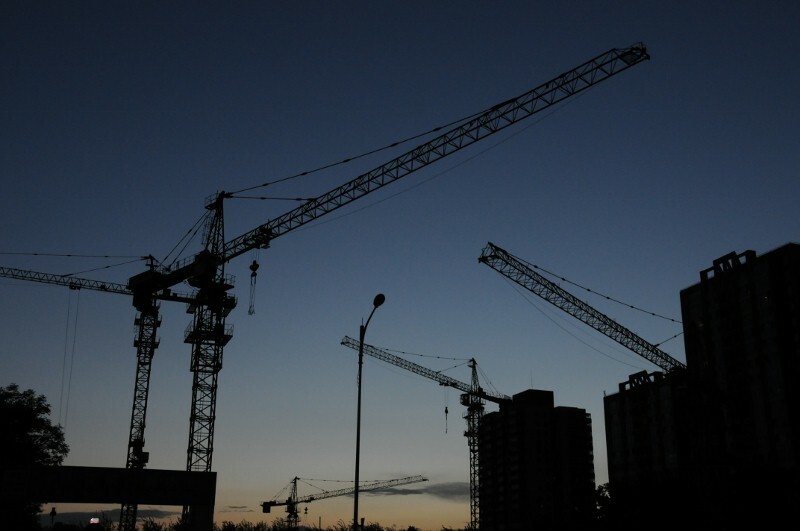 There are a lot of high hopes for this high rising city. A golf equipment demonstration outside a subway station. Looking as pretty as a picture outside a mall entrance. The young are flocking here in droves, and the Europeans and Americans are back as well. A bride and groom pose for pictures in a city park. 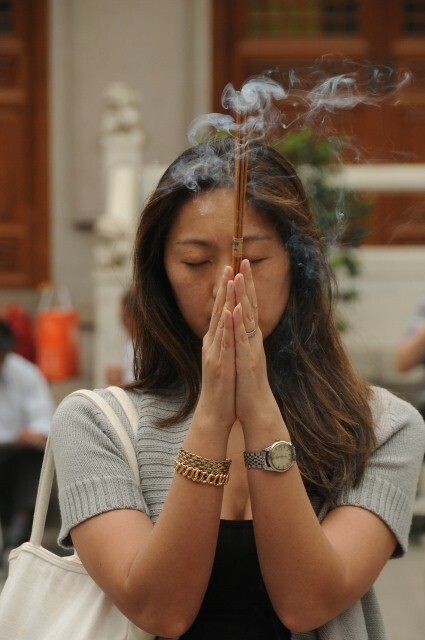 As modern and forward thinking as Shanghai is, stepping into a Buddhist temple here definitely feels like stepping back in time. 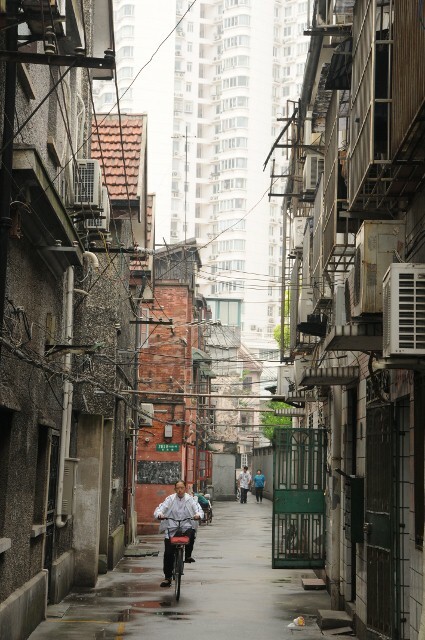 But every city has its alleys, and in some of Shanghai’s, the past lingers. An obedient pet? Dinner? Or both? 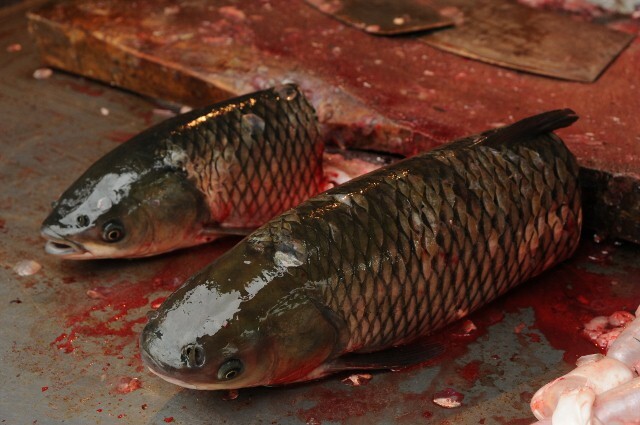 And in a small alley neighborhood night market, the fish are cut and ready to buy, and they were still moving! There was even room in the markets for old representations of those not so market friendly. China today is a complex place, changing in many ways, and seeing this in the market just left me with more questions than answers. 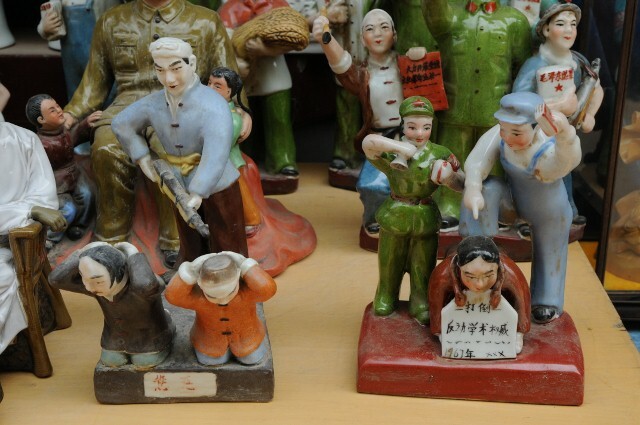 Colorful statues of a dark past. Who is this for? The holdout Maoist who looks fondly on the Cultural Revolution that led to persecution, murder, and ruin for the country? 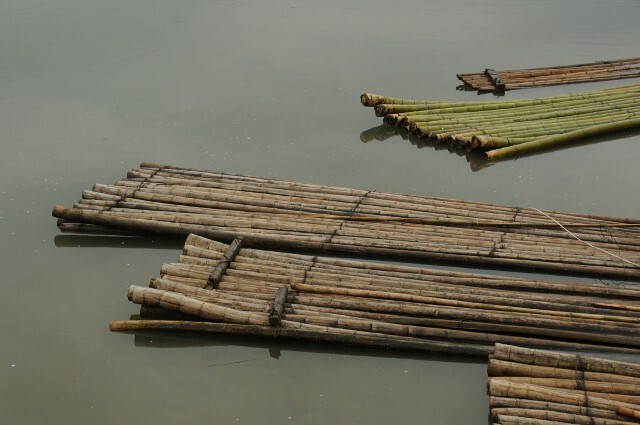 Or is it for the curious tourist wanting a piece of the past? 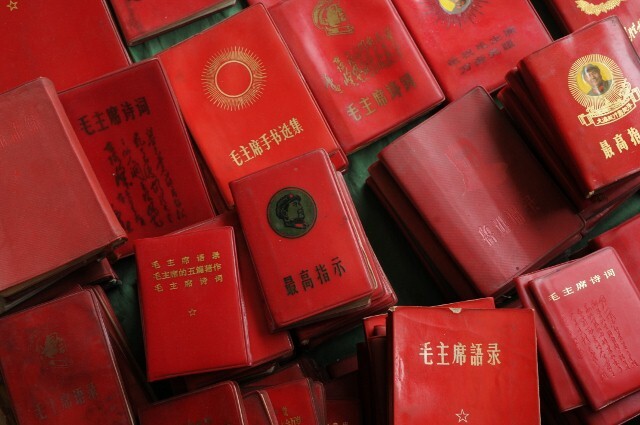 Now the little red books are found in markets as relics of the past. 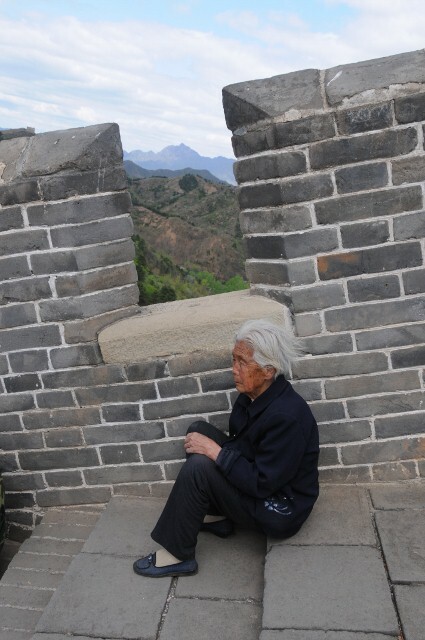 It does seem that China, as a whole, does not look fondly back at those dark days, and since the opening up begun by Deng Xaioping in 1978, the country has been on a steady track of both development and the loosening of restrictions on people’s freedoms. And I think they may even be developing new and better ways of organizing the workings and relationship of government and business. But they clearly have a way to go, since innocuous Websites like Facebook and WordPress were blocked, and China still executes far too many people every year. This should not happen in a truly modern and open society. I think in time they will get there. 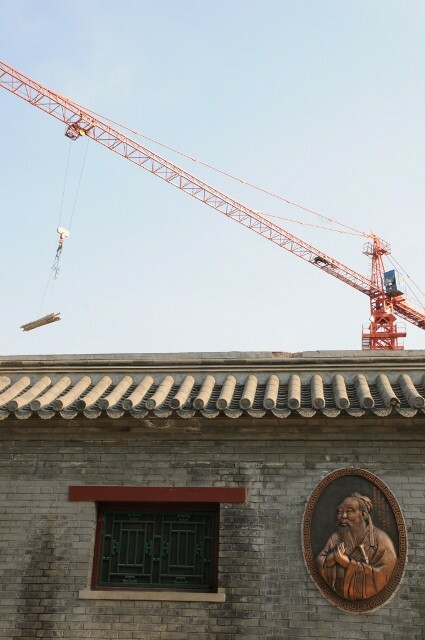 And one day, this picture may be graced with a reminder of a more dignified past that will also point to what promises to be the Chinese century. More and more this is a city with a spring in its step. That happens when the world looks your way. 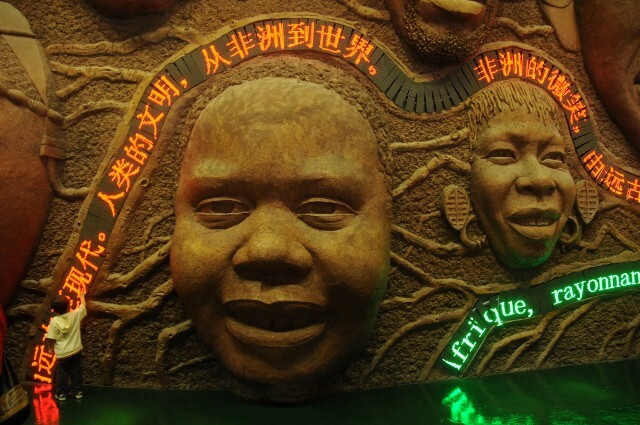 Indeed the world has literally come to Shanghai, as the city hosts the World Expo 2010. The Expo is a sprawling, and I mean sprawling, amalgam of over 200 countries exhibition pavilions. 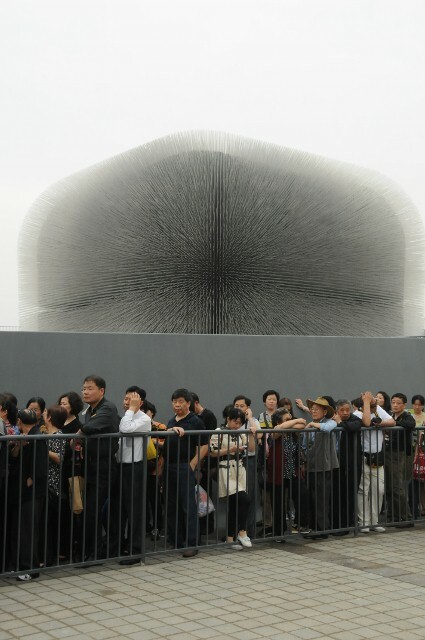 Here the very intriguing British Pavilion. The lines were crazy, with 2-3 hour waits for the popular countries, like China, the USA and Britain – no I did not wait. The African countries were more accessible. I got to play an African drum, drawing a crowd of curious Chinese. And some of the Arabic countries were easier to get into, like Tunisia, Algeria, and Palestine. 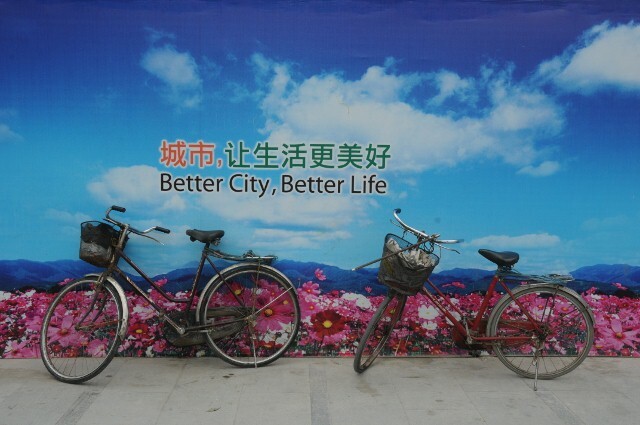 The theme for the Expo was: Better City Better Life, and they seem to mean it, as I found Shanghai cleaner than I expected. They have this cute mascot, named Haibao, who was ubiquitous all around Shanghai. I must say I was sick of seeing him by the time I left – at least I think its a him. And what is this? 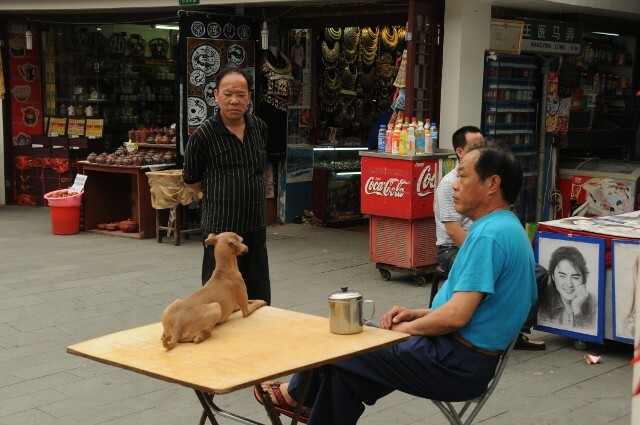 A game of go being played in Haibao’s presence. 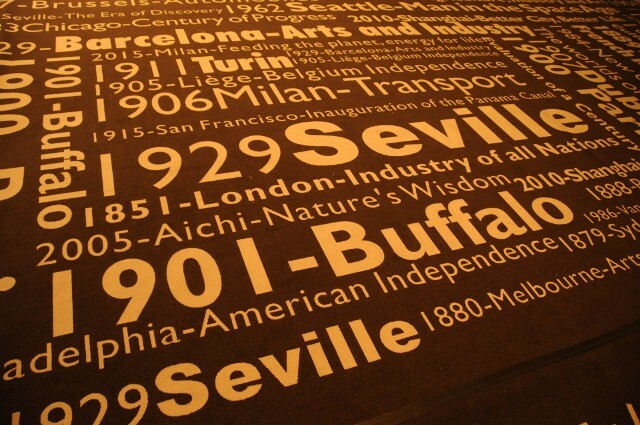 And even my humble hometown of Buffalo got a nod for its Pan American Exposition of 1901, on the floor of a giant mall 10 stories high. 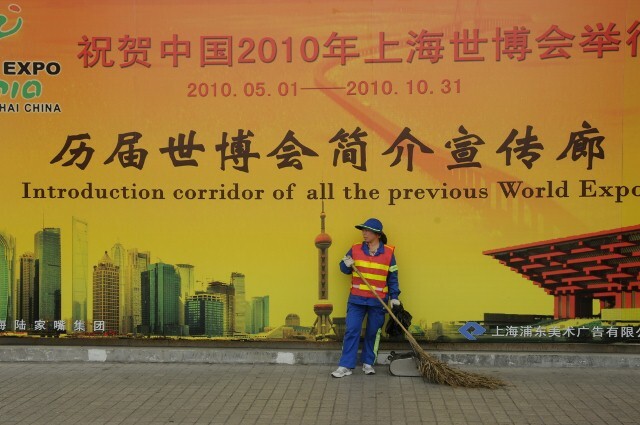 All across China, but especially in Shanghai, it’s all construction, all the time. It’s like the country is a big erector set. 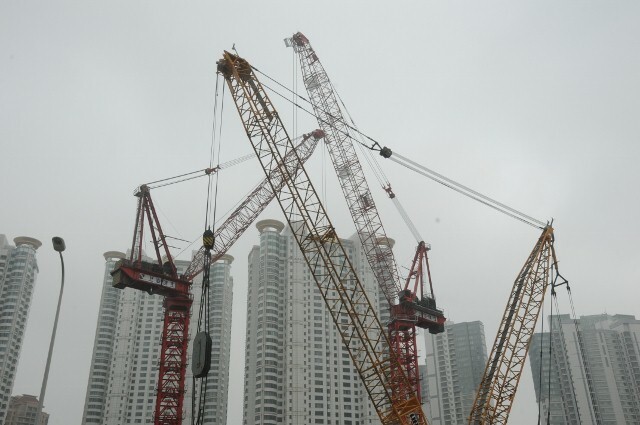 Apparently, there is more square feet of construction in Shanghai now, than all of the built space in Manhattan. Shanghai is already home to the third tallest building in the world, but that is not good enough, so they are building an even taller one here. 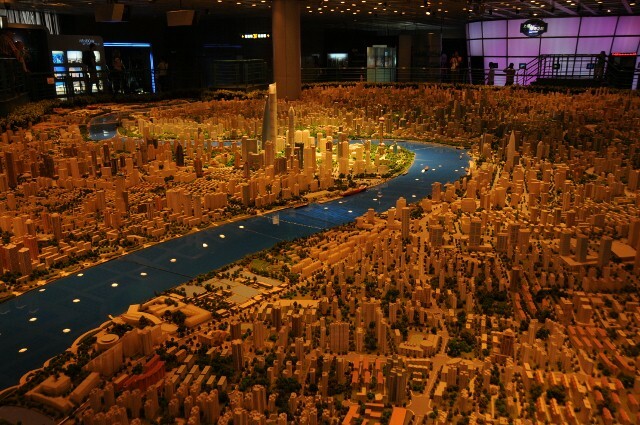 The Chinese are so fixated on the future of their star city they have even built a model of almost the whole city in the Urban Planning Museum. This is a proud city with a colonial past and what looks like a bright Chinese future (unless of course the housing market bubble pops). 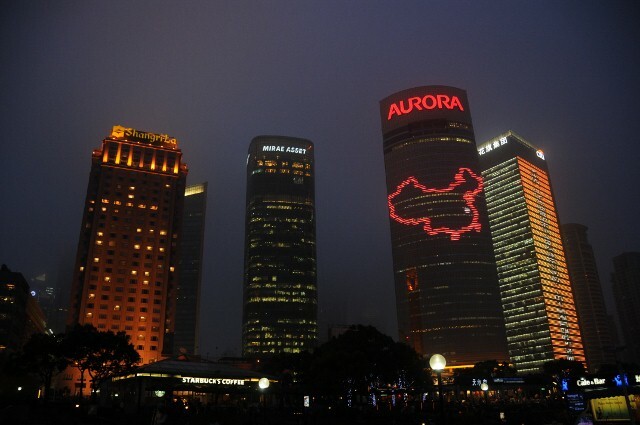 Oh yea, lest you forget, there are always reminders, this is China! Since most of my time in China was reserved for the cities of Beijing and Shanghai, I knew I wanted to get a slice of rural life. 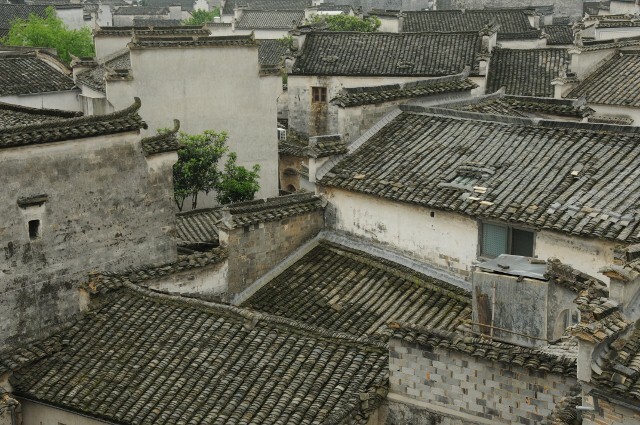 So I picked the small village of Hongcun to visit that is well preserved and, well, lost in time. Of course its idyllic setting made it a favorite of art students who were here in droves painting the scenery. 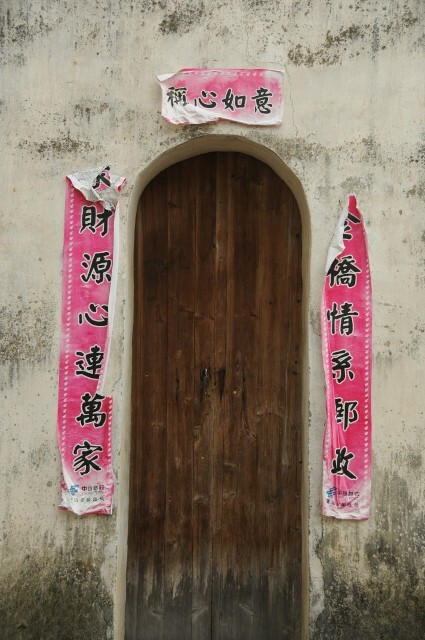 I stayed in a home, a traditional courtyard home, that also serves as a tea house for the visiting art students. This guy’s house was listed in my Lonely Planet guide, but he only discovered that when I showed him the book. He doesn’t seem to get too many westerners. This was my view from the courtyard balcony. 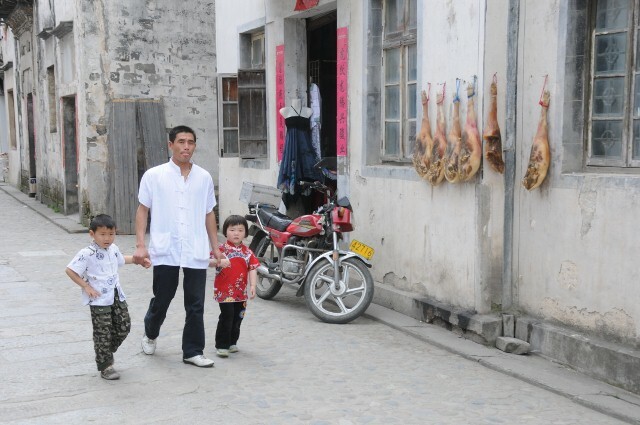 One thing I noticed is what looked like whole legs of pork hanging from people’s homes, or maybe they were butchers. Just sitting there hanging outside…I think I will stick to tofu. 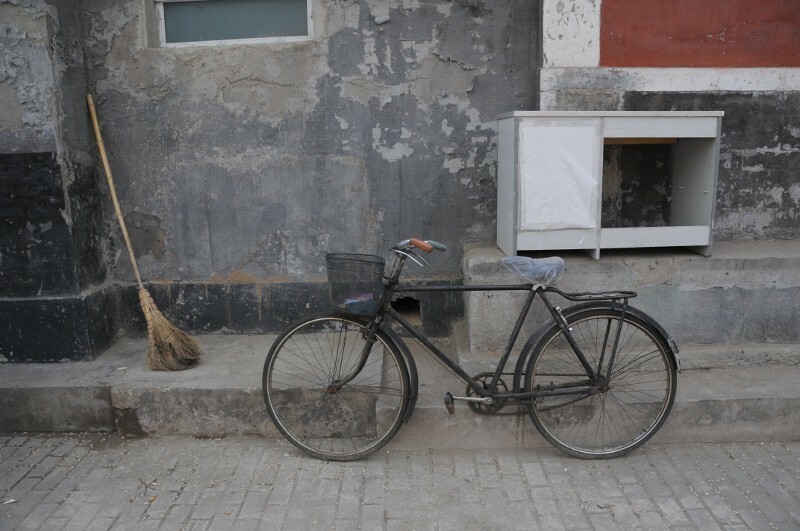 The art students gave the village a youthful vibrant vibe. 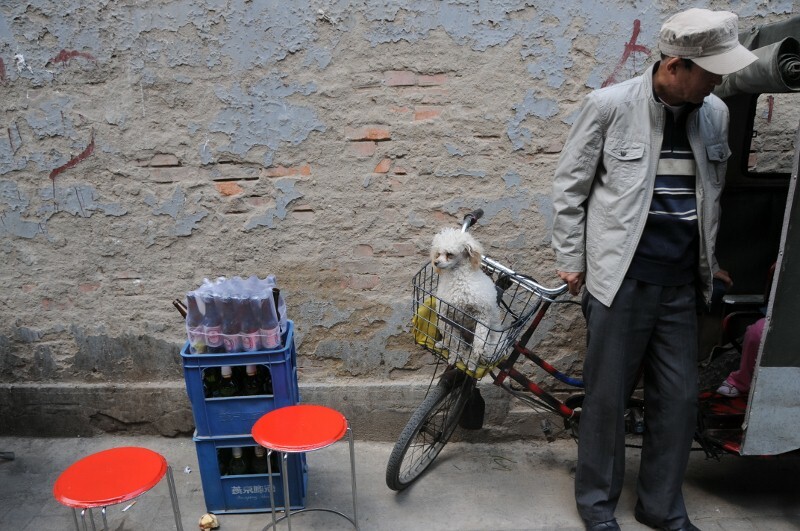 But it didn’t really detract from the authenticity of the village life. I found what seemed to be the tallest structure in the village, a very old viewing tower within one of the old stately homes, from which I could see the rooftops of the village. 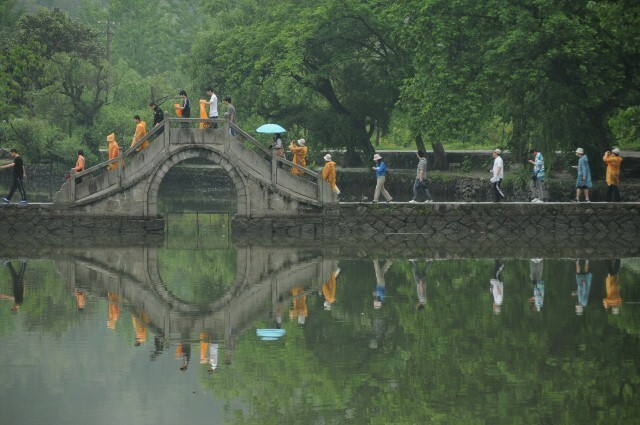 The village is surrounded by a small lake with a picturesque bridge. 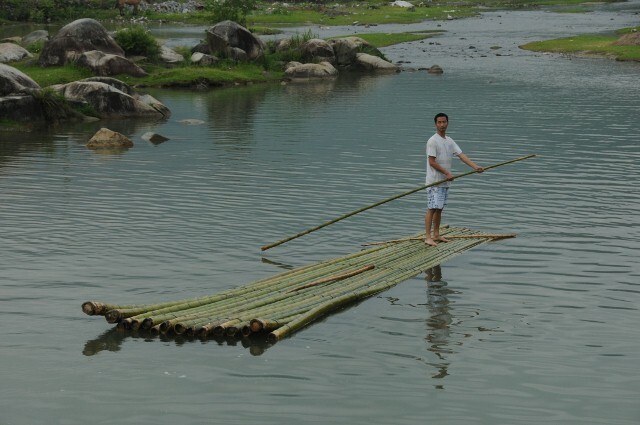 And on the other side, a small river where kids would play with the bamboo rafts. Which were just there for public use it seemed. 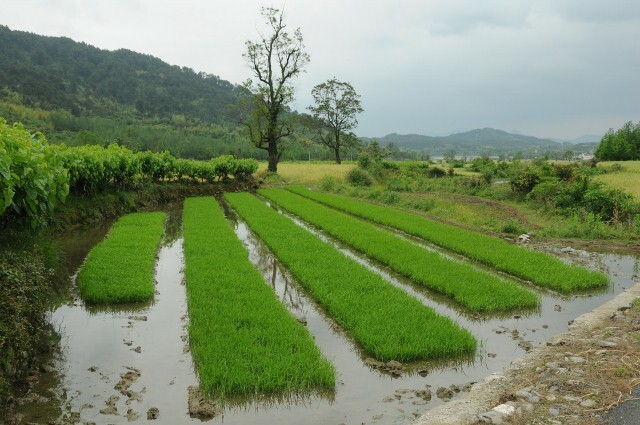 But, not being content to just see the village that everyone was drawn to, I decided to take a walk outside into the surrounding countryside, where I could walk among the rice paddies. 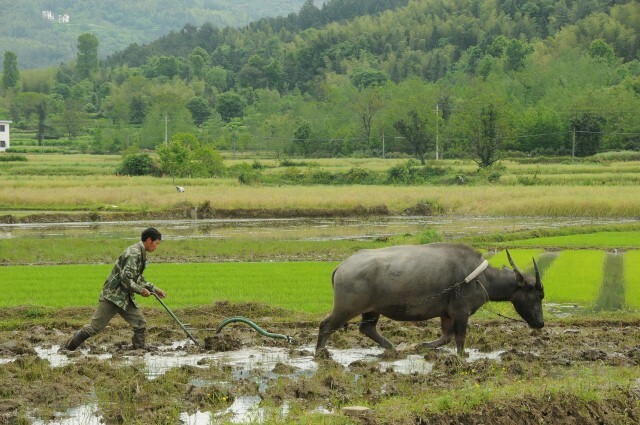 And see first hand fields being tilled using water buffalo, and a way of life that has not yet completely disappeared from China. No this is not a scene out of Avatar, and no I did not die and go to heaven. 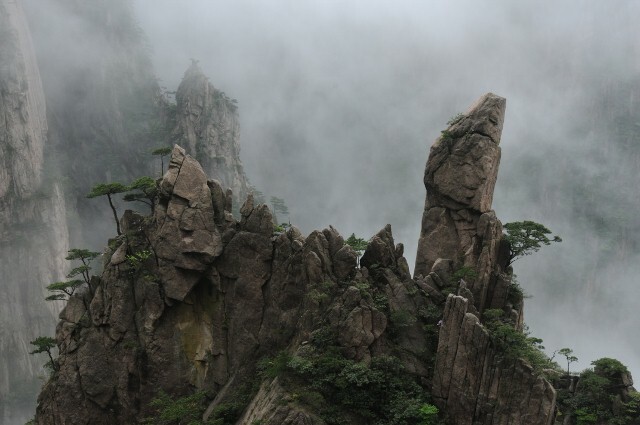 This is Huang Shan, the fabled mountain of Chinese artists and poets. A truly incredible place. 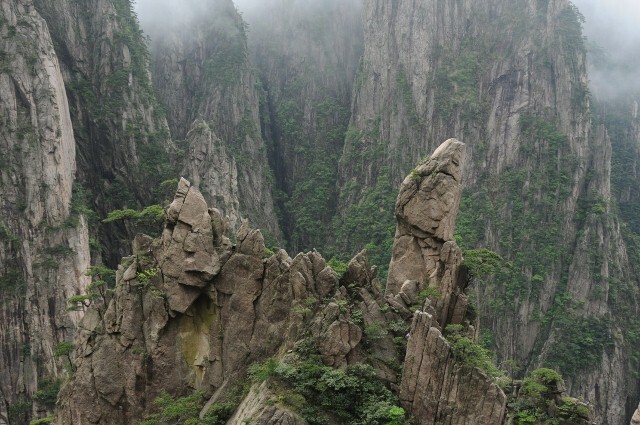 It’s really not a mountain with one defined peak, but rather a multitude of granite peaks and deep gorges with vegetation clinging to what seems like sheer rock. 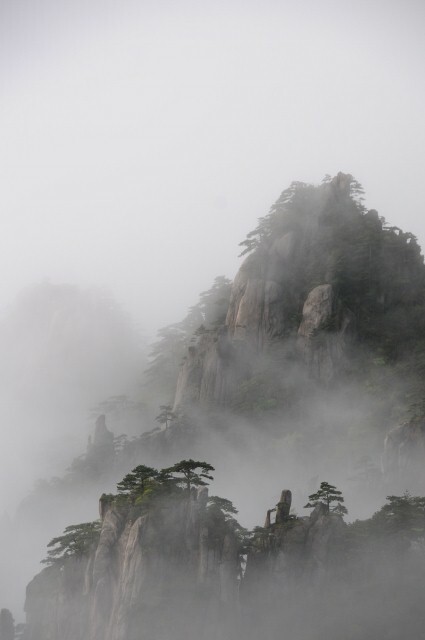 I always thought those images one sees on Chinese scroll paintings were fantastical imaginings, but I assure you they are real landscapes. 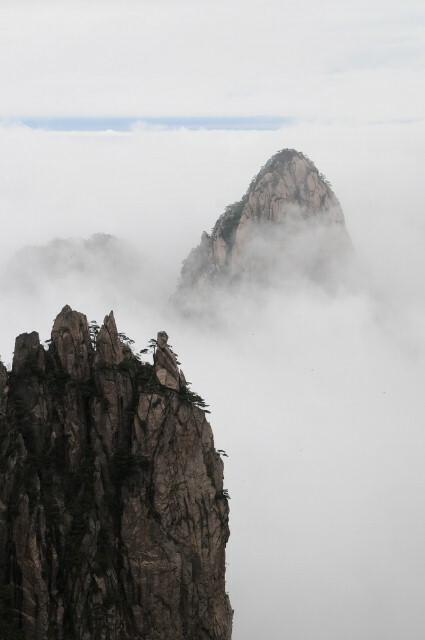 I was fortunate to get up the mountain the day I arrived, after an overnight train ride from Beijing, and a four hour bus to the town at the base of the mountain. I got up there just before sunset. 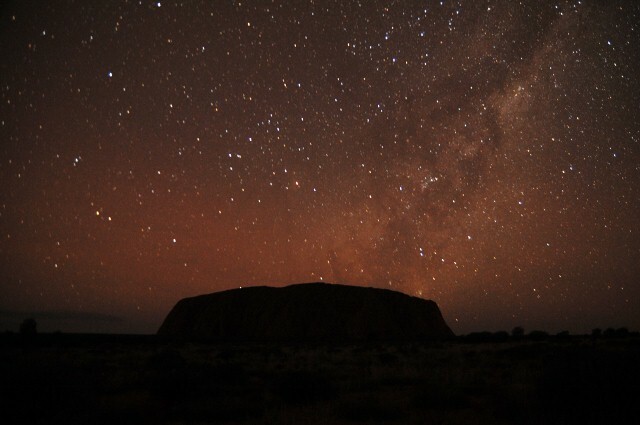 Accommodation at the top was pricey, but worth it. 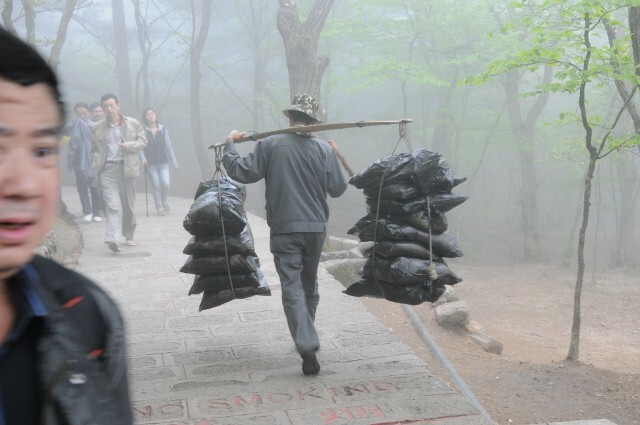 Having left my full pack at a place in the base town, my goal the next day was simply to walk myself down amongst the misty peaks via the Western Steps. 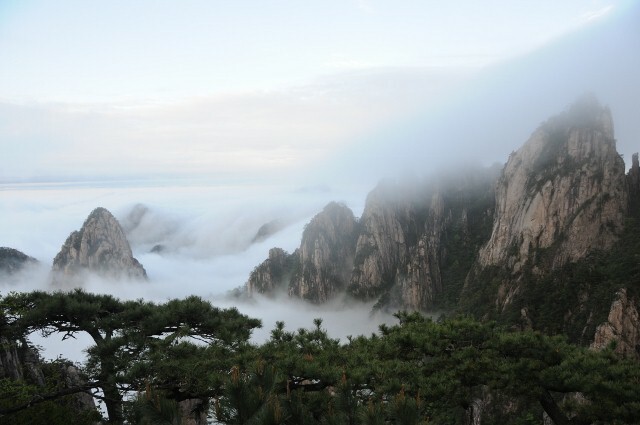 It was truly an otherworldly landscape, accentuated by the ever changing mist and clouds. At one moment something is exposed. And the next it is partially or completely hidden. 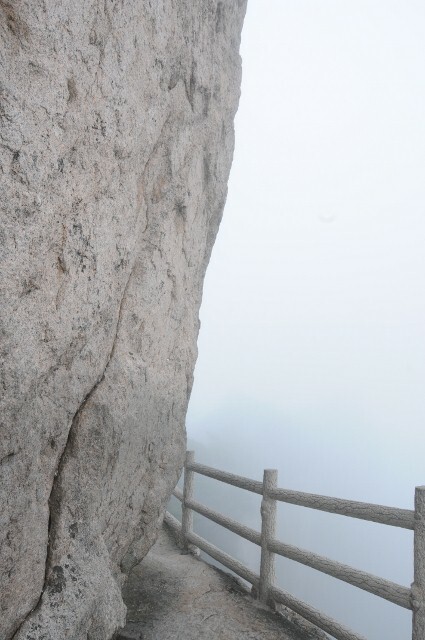 The “trails” were really a series of steps of stone between peaks with much up and down climbing. I found myself on this harrowing series of steps going down deep into a gorge, with the steps built from stone completely protruding from the sheer vertical granite mountainsides, and very short railings. At some point I started to wonder if this could really be the common way down. Then I came across this. This is where my sense of safety kicked in and I decided I was not going down that! I soon found out I was on a different trail that was not for the faint of heart, not that I ever considered myself faint of heart. So I had to do a considerable amount of climbing to get back to where I made my wrong turn, I wasn‘t at the Western Steps but the Western Gorge Trail. All the way down, and all the way back up, but it was worth it! But I can’t really complain, not after seeing this guy. 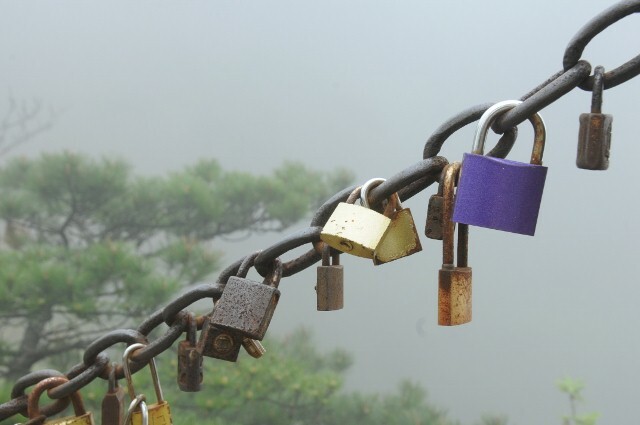 Up near the top there are all these locks on the railings left by young couples over the years to show their commitment to each other, along with the ever present posing for pictures. It’s too bad I do not have my lovely lady with me to share all of this, but if I did, we surely would have put one of these up there. Although this is one big sprawling city of 16 million (all of New York State has but 17 million) it has felt like three distinct cities. 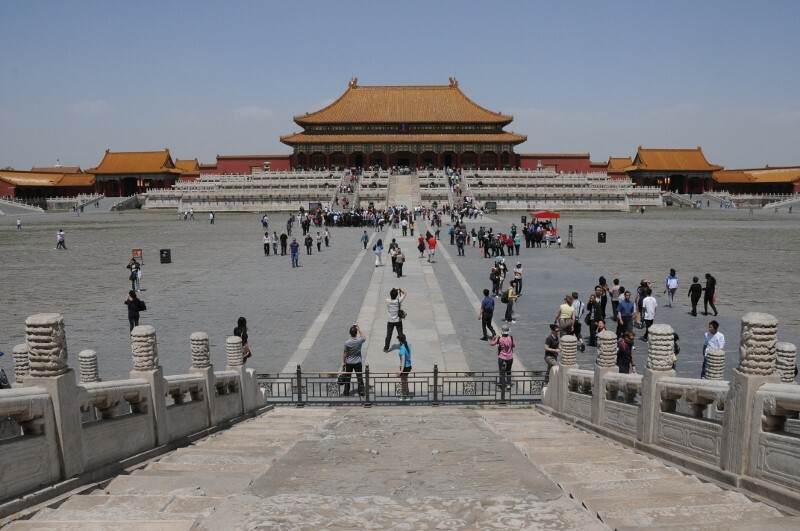 The oldest is the huge forbidden city at the center. 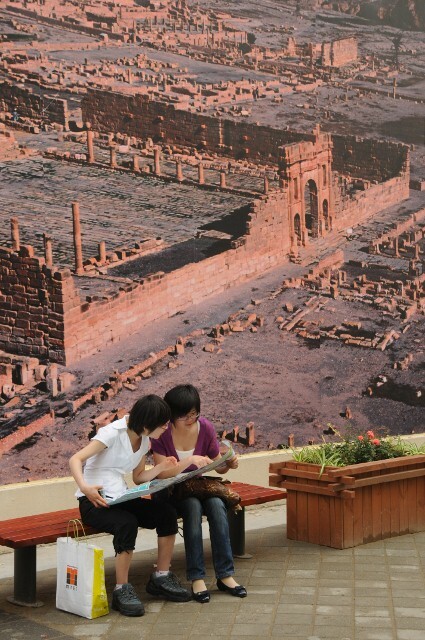 This is the ancient imperial “city” where the dynastic rulers would rarely venture from. 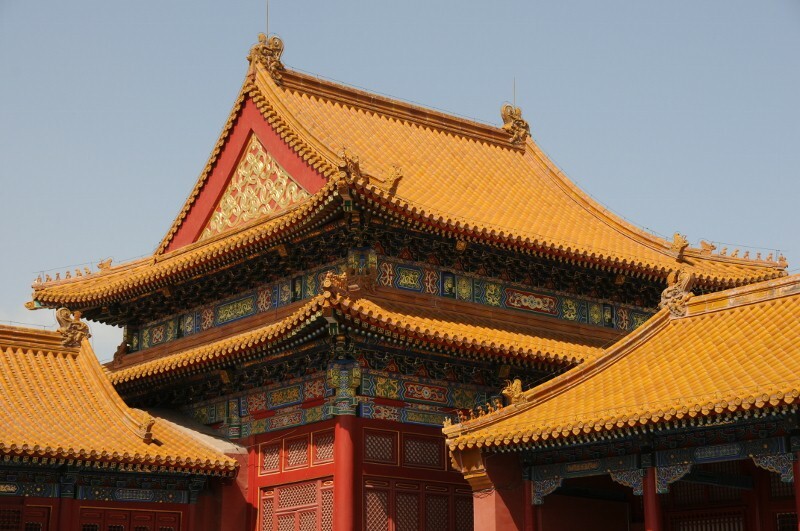 This is a huge complex of walls, huge ceremonial gates, and at the core, the heart of the imperial court, where the rulers and their minions would reside. 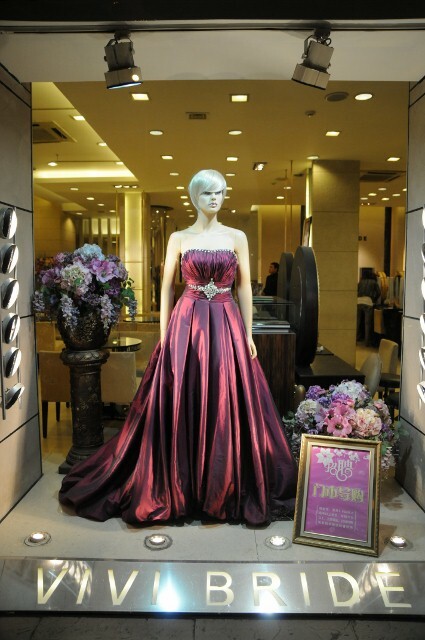 Nothing but the best for China royalty. 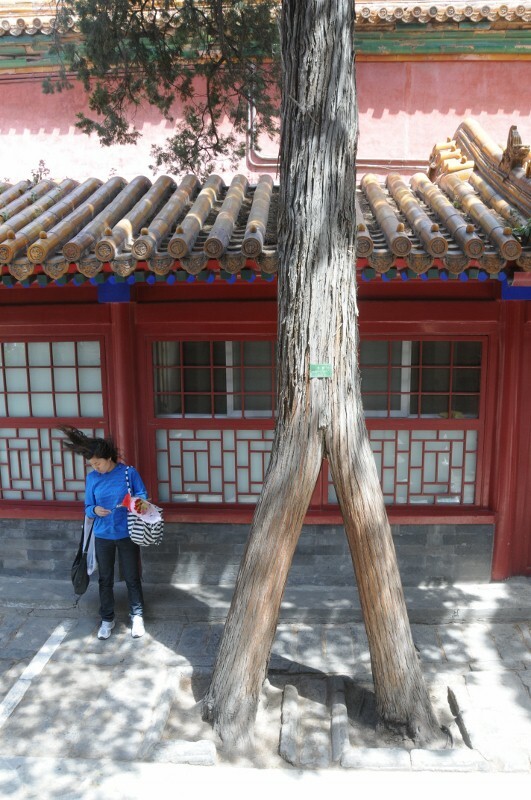 As you can imagine, the place is overrun with tourists, the majority of them Chinese. 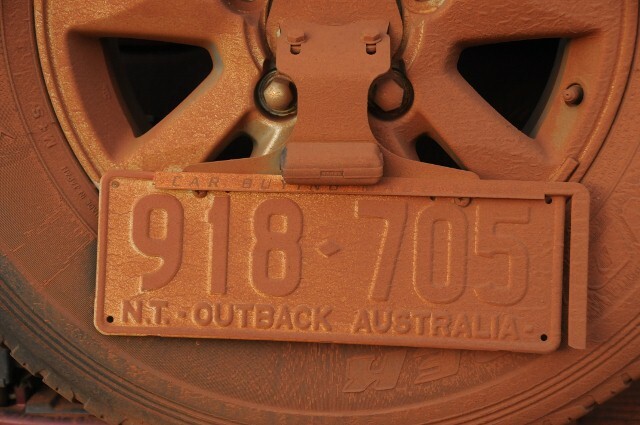 Oh, and did I mention it’s quite dusty here, and windy. 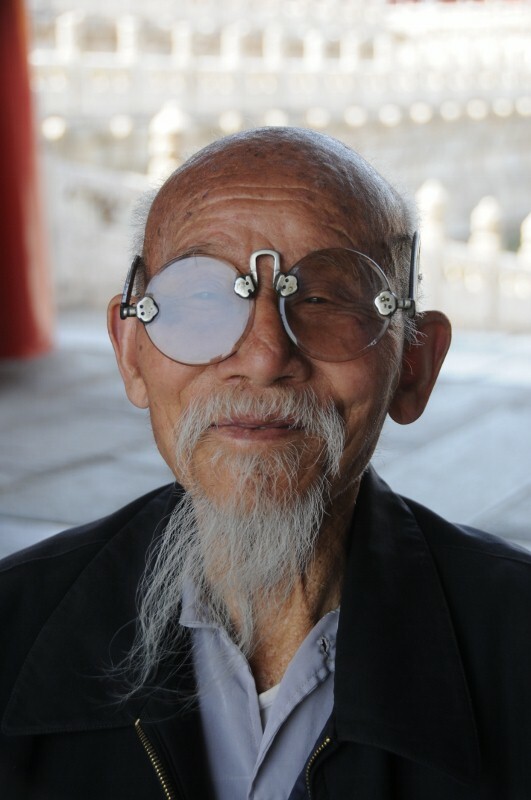 This guy puts John Lennon to shame. And just outside the ancient fortress, the army folks were doing drills. 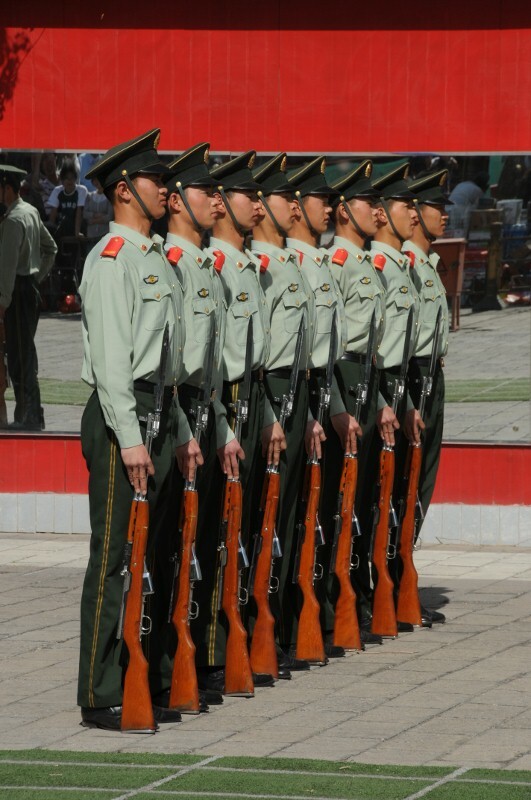 The police and soldiers were everywhere in and around the Forbidden City and Tiananmen Square. 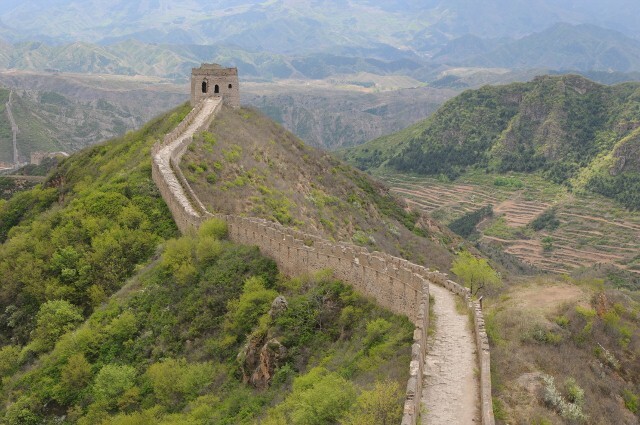 Another aspect of old Beijing is the Great Wall, which snakes over the northern fringes of the municipality one to four hours drive out of town. 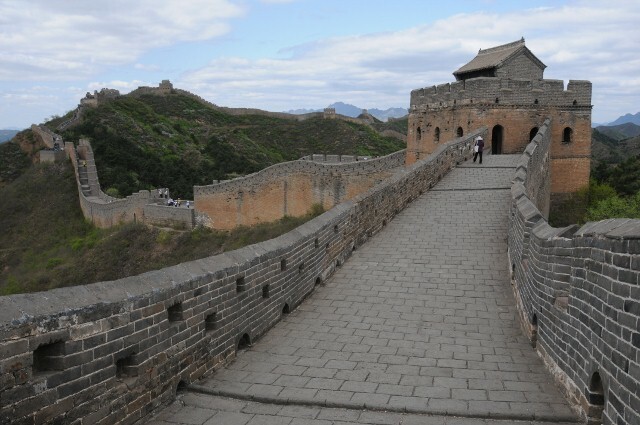 Unfortunately, all this work apparently went for naught, as the wall was never an effective barrier to the Mongols and such, let alone Coke and McDonalds. 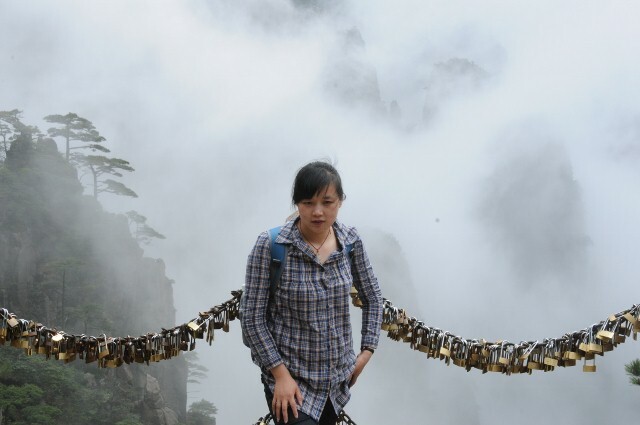 I hiked a four hour stretch between Jinshanling and Simnatai. When you get far enough away from the end points the mass of tourists thin out, as there is quite a bit of climbing up and down involved. But there are always local vendors trying to sell water, trinkets and even beer. The views from the various watch towers were great. 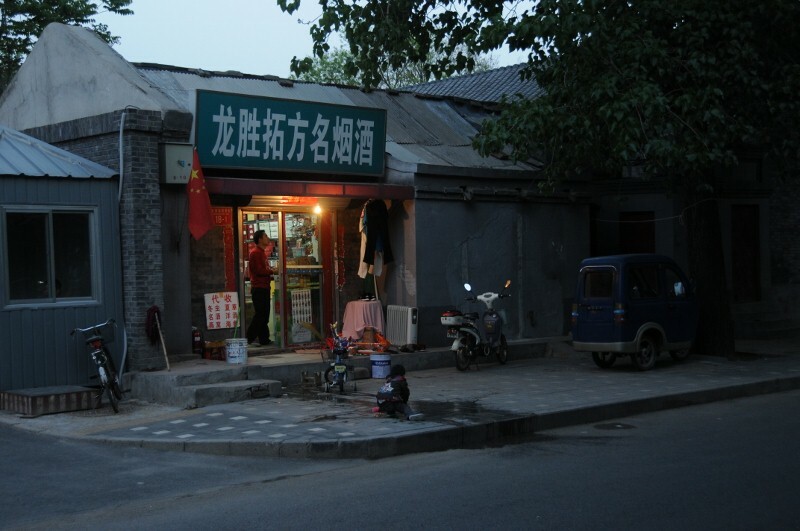 Back in town, the second part of Beijing I noticed was the Hutong, the old alleyway neighborhoods of courtyard homes and small shops. 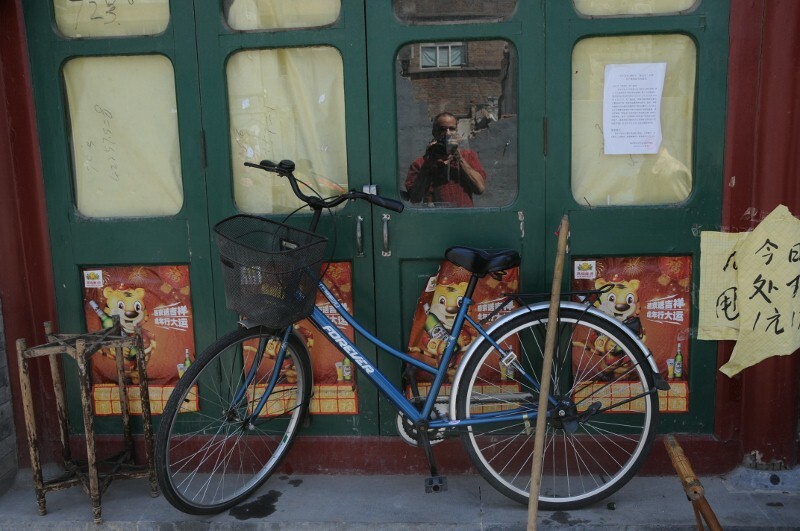 Everywhere, the bikes were ubiquitous. And the sense of a grey dustiness was unavoidable. These neighborhoods seemed frozen in time, but yet were very active with life. 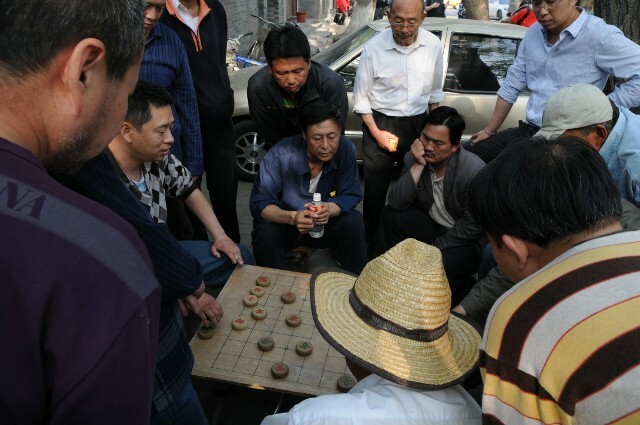 Here a group of men watch a Chinese Chess game. 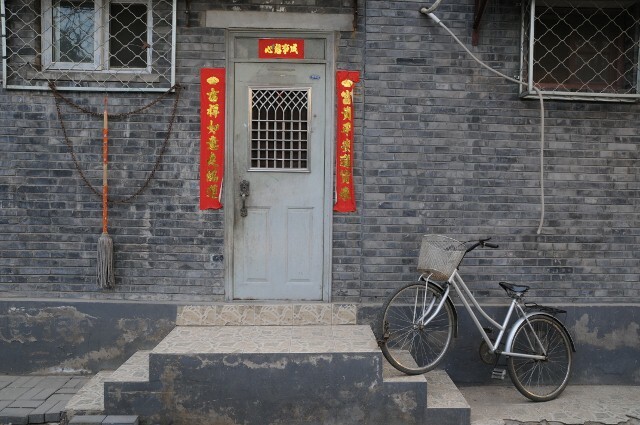 As the city continues to develop and modernize, these old neighborhoods are being bulldozed over, and although some have been deemed historic and will be preserved, many more will succumb to the future that is modern China. Which of course is the third side of the city one can’t help to notice. Things are being done here on a scale and at a pace like nowhere else in the world. 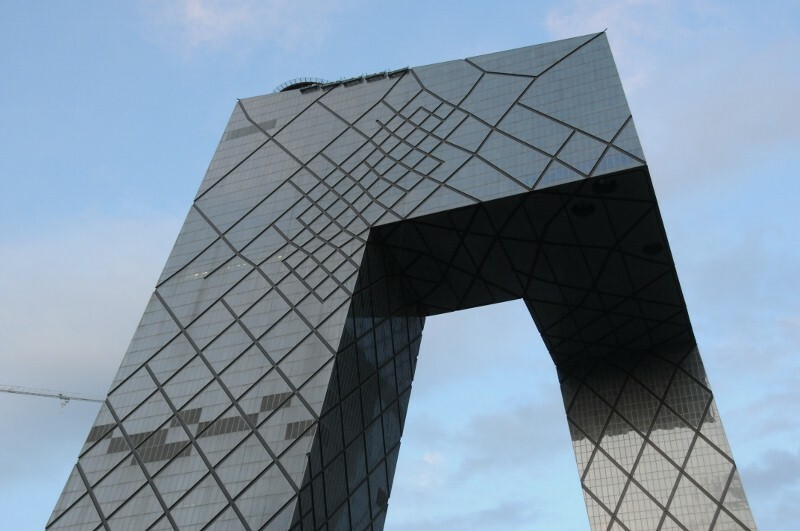 Here is the innovative CCTV building. 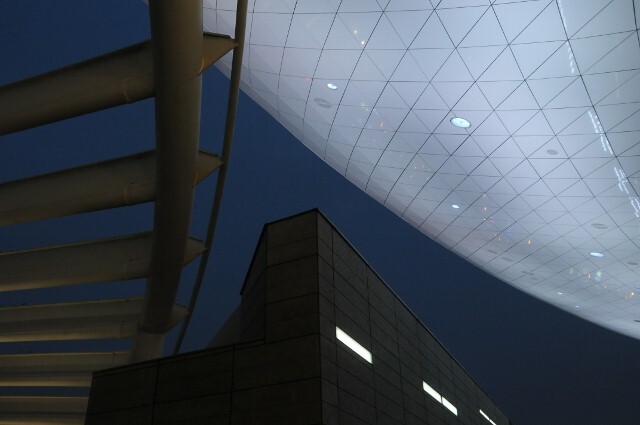 Top name architects from around the world are being brought in to design cutting edge buildings that become instant landmarks. 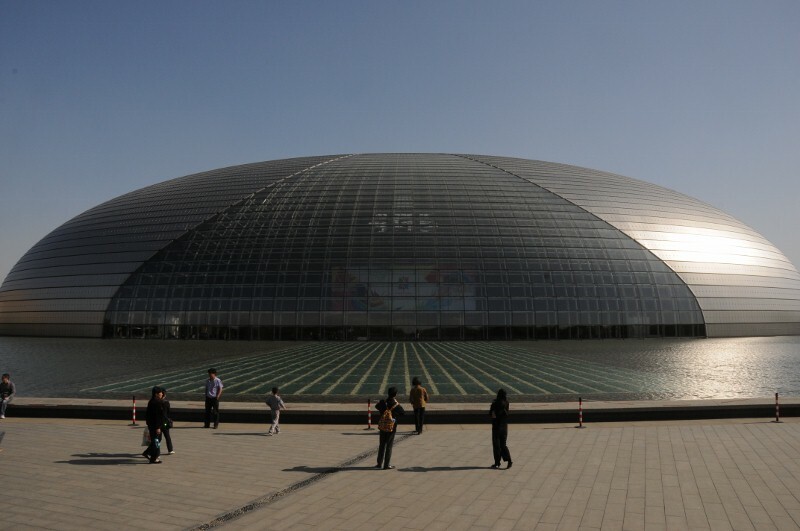 Here the National Theater of Performing Arts, which is surrounded by water, has a glass ceilinged entry way that leads into the structure. And then I just happened upon this place, called appropriately “The Place”. 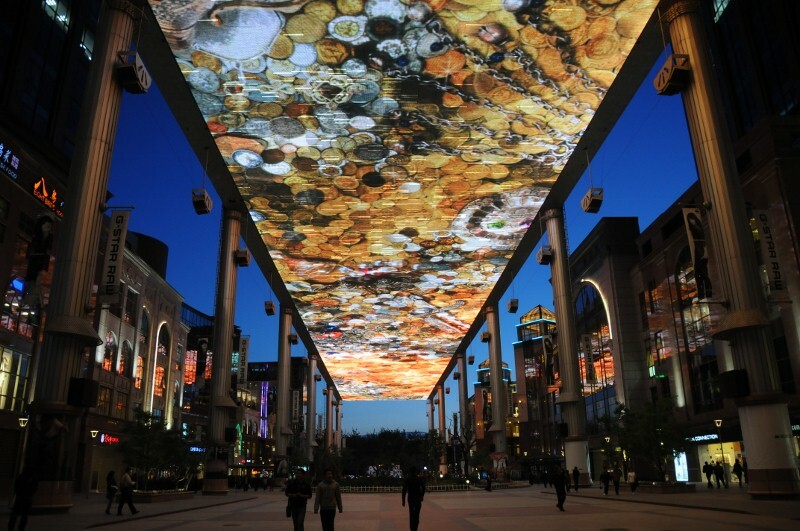 A block long rooftop video screen, perched three or more stories up on pillars and lined by high end shops, restaurants, and hotels. 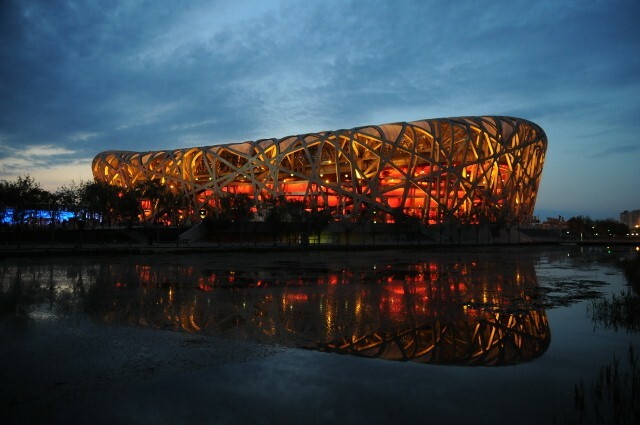 And of course, across the street, the landmark “Birds Nest” National Stadium. 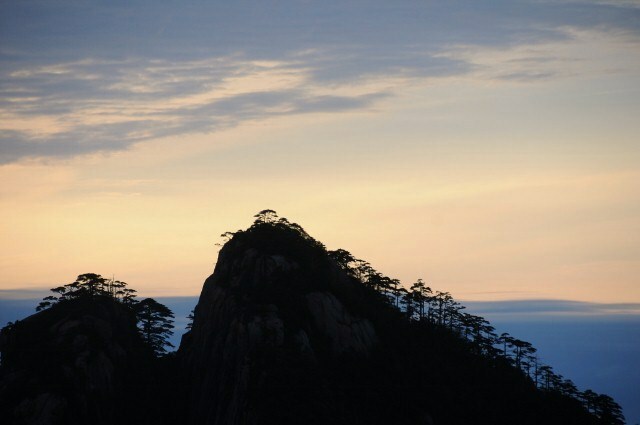 Ok, now it’s time for a break from the city as I head south for the mountains around Huang Shan. But before I go, what do you think? How would Gretchen look in this? After 48 hours of flying, and 6 hours of sleep, I woke up and took a great leap out of bed and found myself here. 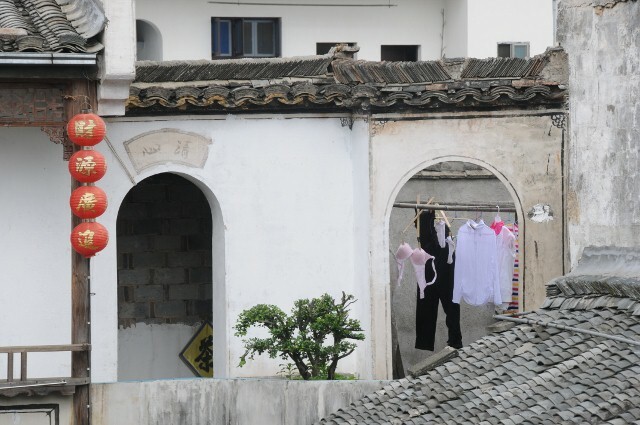 My hostel is in a what is called a Hutong. 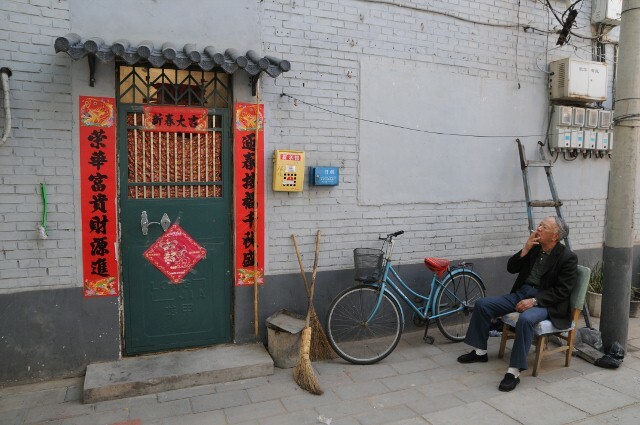 They are the modest dusty neighborhoods of old Beijing, and they are disappearing fast to the rapid development that is turning old Beijing into a new powerhouse city of Asia. But the dusty ghosts of the past live on, for now. 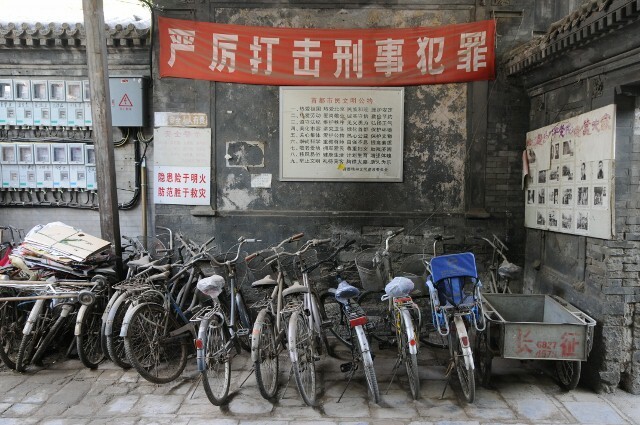 But who comes to Beijing to see old dusty neighborhoods? Probably not these folks. No, they come here to see the imperial history and to see this guy. 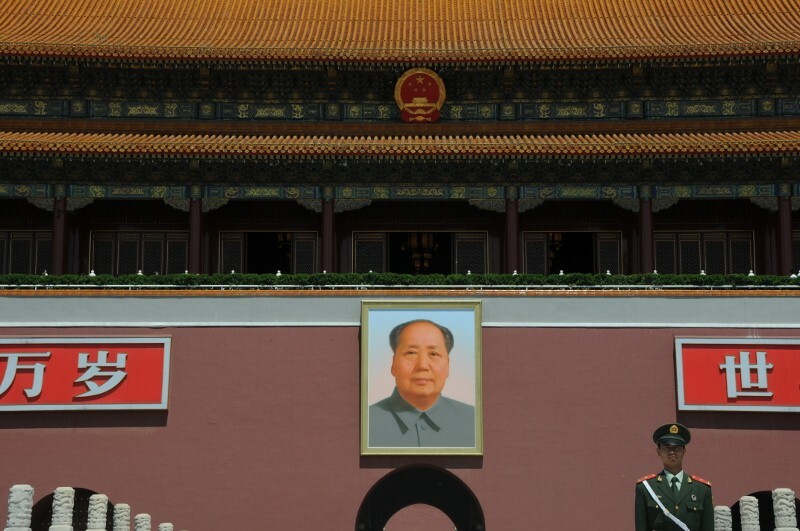 One can not get into the Forbidden City of the old Chinese dynasties without passing under Chairman Mao. 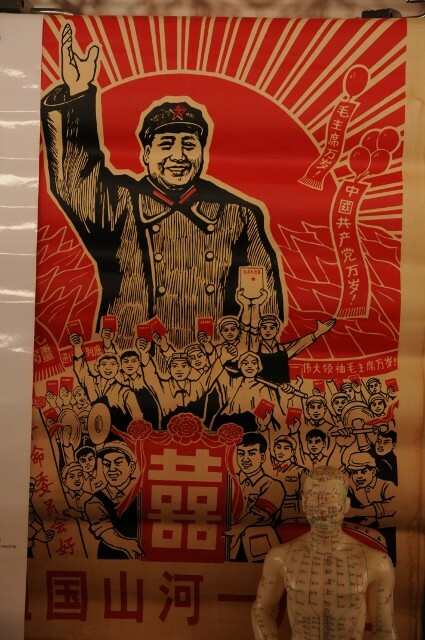 But apparently the watchful eyes of Mao aren’t enough, as there are police or army everywhere it seems. But they are still short on Fashion Police. 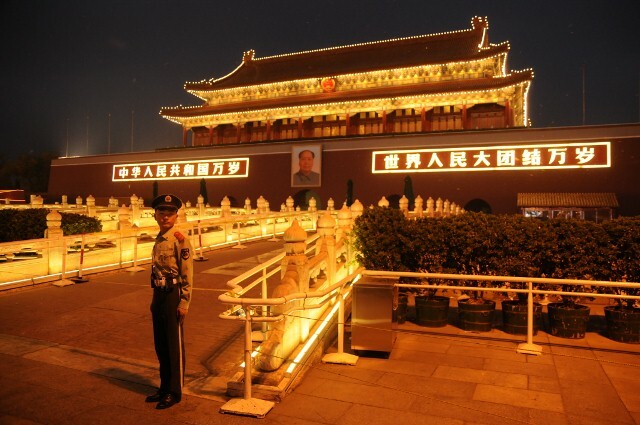 That is certainly around Tiananmen Square. Synonymous in the West with the brutal crackdown on a peaceful pro democracy protest in 1989, it is always under the watchful eye of the government. You must go through security just to get there. 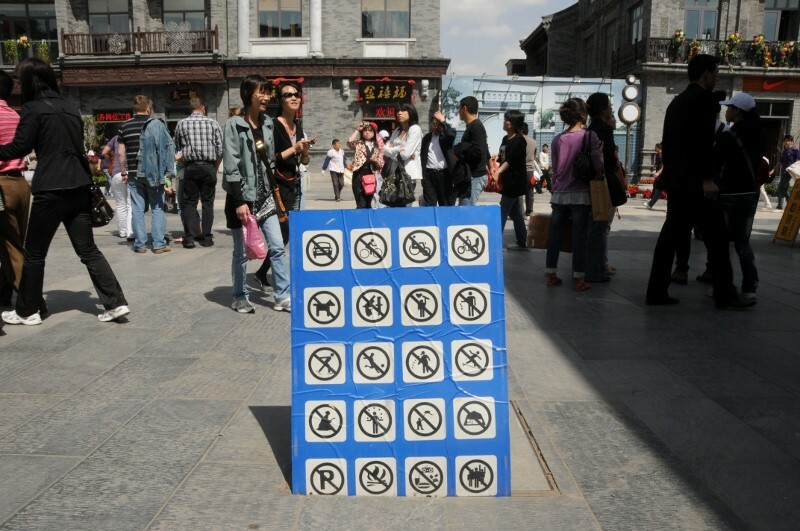 And of course they seem to like rules here, including No FaceBook, No Twitter, and no WordPress, etc. Well this American says no way, and that’s why you’re hopefully reading this now. But the government can’t seem to stop people from superstitiously putting their money in water fountains. And this long day comes to a close. 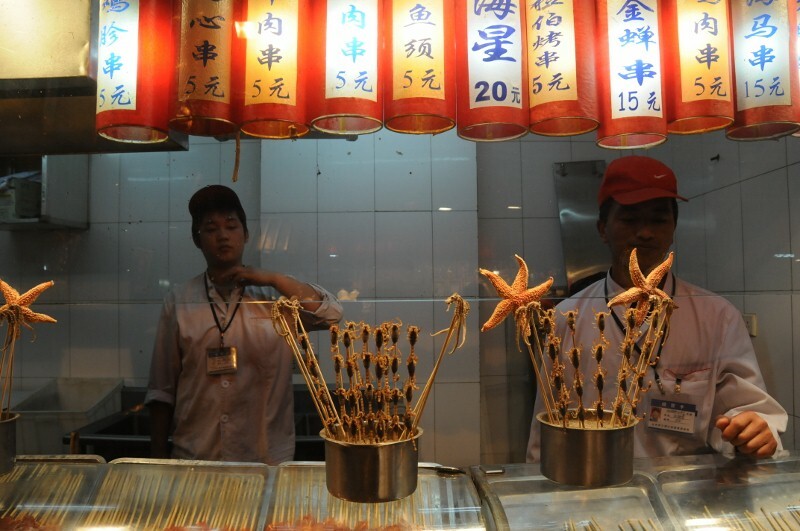 Are those skewered starfish? Surely those are not scorpions? OMG, they are. And think of the lucky one who gets to eat one of those delicious tarantulas. No, I did not try one, and no I won’t.